Usually when you think of an exfoliating mask, you think of something that will itch and burn your skin. Not always so though. I finally found a great mask that exfoliates the skin and leaves it in better condition. 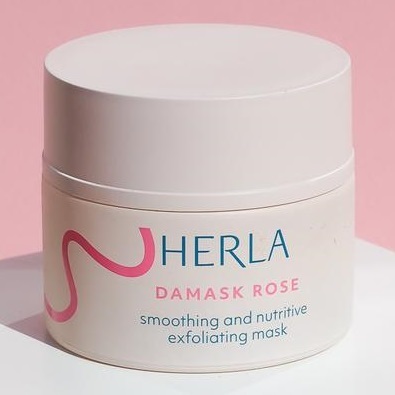 It is called the HERLA Damask Rose Smoothing and Nutritive Exfoliating Mask. This creamy light pink exfoliating mask will unveil silky smooth, glowing and nourished skin. It contains Damask rose oil, rosehip oil and black rose which are full of Vitamins A and E. These improve your skin's elasticity, smoothness and help to even out its tone. It also contains pomegranate, grape, fig and white mulberry to deliver necessary nutrients, brighten and clarify the skin and delay skin aging. Fruit acids from apples, grapefruits and lemons effectively exfoliate and refine your skin's texture. Ginkgo biloba and gromwell help to remove toxins and impurities from the skin. After using your skin will feel soft, supple and nourished. It will not be red, irritated or at all feel like you just exfoliated your skin. This can be used on all skin types. I would highly recommend it for sensitive and mature skins. This is definitely a great product that even the most sensitive of skins could use. To use, apply to cleansed face and neck, avoiding the eye area. Leave on for 10 minutes and rinse with warm water. Use 1-2 times a week. Great for any skin type including sensitive and acneic skin. I would even recommend this for skin with eruptions. It is very soothing to the skin and should help with redness and irritation. The HERLA Damask Rose Smoothing and Exfoliating Mask is available from www.herlabeauty.com. Like HERLA Beauty on Facebook: https://www.facebook.com/herlabeautycom/ and Follow HERLA Beauty on Instagram: https://www.instagram.com/herlabeauty/.